In the Book of Mormon, the prophet Alma shares this thought, "By small and simple things are great things brought to pass." We are so lucky this is true! Like many, I want to make a huge difference, however, I am just small and simple. There are many that do more, give more, are smarter, wiser, better writers, etc. And that's okay because I believe what Alma says here is true. A few years ago I got extremely tired of Facebook. I was spending so much time on there and some of the things I was seeing were driving me crazy. Because of that I decided to remove my Facebook profile. Instantly I felt free! Free to live in the real world. I no longer thought of my life in status updates. I really had no idea what was going on in people's lives, so when I saw them I was genuinely curious. It was bliss. And then... I felt pricked. I started feeling like I should get back on. (A very small and simple thing.) It was an uncomfortable feeling because I had no desire to be on Facebook and I had been so vocally against it. As time went on this feeling became stronger and stronger and I could no longer ignore it. I thought to myself that I was happy to get on Facebook again as long as I could use it as a missionary tool, that was my condition. While I don't intend to share a testimony of Facebook, I do want to share that through small and simple status updates, sharing videos that have great meaning to me, posting pictures with my family, sharing thoughts that weigh on my mind, great things have been brought to pass. It is extremely likely that no one will be baptized into the Church of Jesus Christ of Latter-day Saints because I updated my status with a lovely quote from Patricia Holland. However, I want it to be extremely obvious that I want you to know that I know. 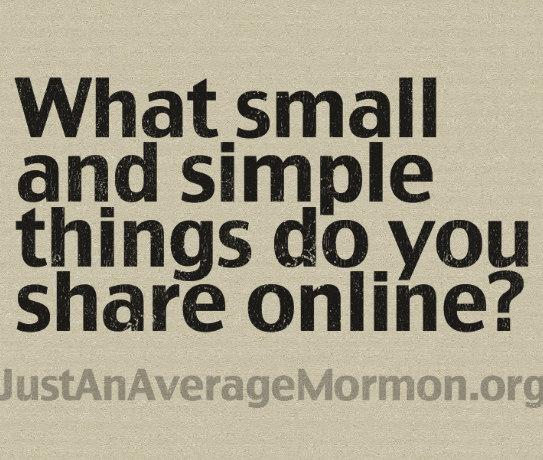 What small and simple things do you share online?